ear ring stopper, metal part not required. We can use plastic ones. Using cutting pliers, cut paper clip as shown in img below. We will be using left side part. Make four like this. Glue these four metal pieces as in img below. 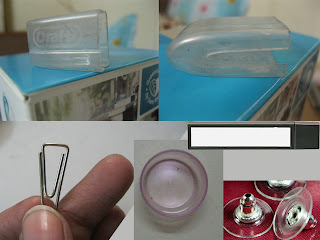 Now remove the metal part from earring stopper or else use a plastic stopper. I used plastic one. Now apply glue on top and stick it to the metal pins as in img. Now slide that into the oral-b brush cap and glue it firmly. Now remove the cap and cut the top part of pencil lead box , it will be of the size of your finger. Now insert gum tape into the box opening and onto the brush cap as in img below, to make a flexible head. Now glue this onto the card or any base firmly. Now insert the deodorant cap by lifting the flexible head of the processor. Food processor is ready. I have to paint the whole thing leaving the metal part and have to add a button for start n stop and a red kundan(a small drop sticker) as indicator and wire and a plug. Excellent!! what a wonderful idea. Thank you so much for yet another awesome tut. Thank you for sharing all your tutorials. You are very helpfull. The mixer is a wonderful idea. food processor motor is so powerful to figure faster, higher result, and save time. the website has an enormous selection of food processors from the most basic, cheap models through to high specification skilled models that do everything from chopping and pealing to mixing and liquidising. Use our handy refinement menu on the left to assist create your choice. Te ha quedado fantastico, gracias por compartir.